For all but a few of Shamitabh‘s two hours and thirty minutes, I wished I was anyplace other than the theater. I would spare you that same pain. The element of Shamitabh that should’ve precluded it from ever being made is its asinine premise. Dhanush plays Danish — all three leads play characters with variations of their own names — a mute, small-town guy who wants to be an actor. He fails to break into the Mumbai film industry until a sympathetic assistant director, Akshara (Akshara Haasan), takes him under her wing. Akshara’s father is a doctor whose colleagues in Finland have created a revolutionary technology to aid mute people. The technology involves implanting a chip in the patient’s throat that acts as a receiver. When words are spoken aloud by someone wearing a connected earpiece/microphone, the sound comes out of the mouth of mute patient when he moves his lips. In essence, the technology turns a mute person into a living ventriloquist’s dummy. This invention is idiotic. Why would a mute person want to speak if he always had to do so in someone else’s voice, never able to speak his own thoughts? Who would want to be the person permanently tethered to mute person, effectively rendered mute themselves for the sake of someone else? Somehow, Danish becomes a superstar actor after he hires Amitabh (Amitabh Bachchan) — a drunk with a great baritone — to supply his voice while making movies. No one on the movie set wonders why a 30-year-old guy sounds like a man in his 70s. The sheer stupidity of the premise is reason enough to avoid Shamitabh, but there are many other reasons to dislike it as well. Writer-director R. Balki clearly intends for Shamitabh to be an exploration of the actor’s craft and filmmaking in general. The stupid premise might have worked as a satire, but Balki’s Shamitabh is a straightforward wannabe tear-jerker that provides no insight on its subject matter. For a movie about filmmaking, there’s a distinct absence of craft in Shamitabh. Shots are framed awkwardly. Transitions are jerky. The editing is poor. Scenes are too long. A romance scene between Danish and an actress is totally out-of-place. The dialogue is too on the nose. More distracting than any of these flaws is the movie’s music. The songs are horrible, but the incidental music is downright clownish. Any emotional moment is punctuated with garish musical cues so amateurish that it’s hard to believe that this is Balki’s third film. Perhaps the greatest indictment of a film that’s supposed to be about actors is that the acting is terrible. Dhanush’s movements are exaggerated to a ridiculous degree, as though his body is rebelling against the fact that he can’t talk. Akshara’s facial expressions are bizarre, and she delivers her dialogue in either a monotone or hysterical screaming. She needed better direction in her debut film. There are moments when the legendary Bachchan shows his skill, in subtle reactions to some ridiculous request by Danish. But Bachchan gives a number of excessive monologues that would be tiresome no matter who delivered them, and they destroy the flow of the film. Watching Shamitabh is a uniquely painful movie-going experience that should be avoided at all costs. This entry was posted in Reviews and tagged 2015, Akshara Haasan, Amitabh Bachchan, Bollywood, Dhanush, Hindi, Indian, Movie Review, R. Balki, Shamitabh, Zero Stars on February 6, 2015 by Kathy. Did you get to see the little kid who played young Danish? He was cute. I think the criticism would’ve been more effective had Balki not tried to have it both ways. Danish/Shamitabh finds success by playing a character named after a brand of soap, which is a funny idea. But then, in what is supposed to be a touching moment, Danish makes some Knorr Cup of Soup for an ailing Amitabh in a Knorr Cup of Soup branded mug. Balki benefits financially from the same corrupt system he’s trying to criticize. That cynicism really ticked me off. Hi, Anirudh! Had I not been planning to write a review, I would’ve walked out of theater after 30 minutes. TV is a safer bet. And the same reason for which these masters came together to create a Masterpiece. As BigB says it SHamitabh! R Balki, Rajnikant, Kamal Hassan (after Giraftaar), unite with @SrBachchan in the debut of Shruti Hassan. Meant for the class, not the mass, its Balki’s third endeavor with @SrBchchan after, “Chini Kum”, and “Pa”. “Masterpiece” is quite the stretch. I saw and reviewed Balki’s Cheeni Kum and loved it. I also saw and reviewed Balki’s Paa – which also starred Bachchan. I thought it was a moving and fine film – that was quite distinctly uncommercial, but still entertaining. So my expectations (and hopes) were that this would be given a strong or positive review by Kathy. That would justify a 55 mile drive up to Tampa to see it. With Dhanush and Big B – how could this be anything less than great? That’s what one would think before hand. But given that Kathy said that had she not had to review it – she would have walked out after a half hour. Now that is a key statement for any film critic to write. While the English language Indian press rated the film higher than did Access Bollywood, three point five is only a cut above average. I think the Indian press were in the main disappointed rather than enthralled. It’s true, Mike. I’ve walked out of just a few movies in my lifetime, and this would’ve been one of them. The reaction of the crowd I watched the movie with backs up the mildly positive reviews of many mainstream Indian critics. There were about 40-50 people in the theater with me, which is a lot for a Friday morning show at my theater. They were mostly quiet throughout the film, laughing in three or four spots. At the end, everyone walked out of the theater in complete silence. No chit chat among couples or friends about what they thought of the movie, just dead silence. Not exactly an enthusiastic reaction. To be given a miss, for sure. It would be sad to see this one after the thrill of Pa and Chini Kum. Quite an interesting analysis! While I agree that a lot of elements in the film are beyond belief, I feel that the film more than anything is an earnest expression of love for cinema. Deception is the key to the art and science beyond filmmaking. Now most of the times the audiences can question what they see on the celluloid but often they choose to suspend their disbelief… and the same applies to Shamitabh. 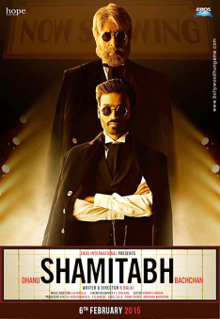 ‪I feel Shamitabh is part entertaining and part thought-provoking but it has its share of flaws and inconsistencies. However, if you truly love cinema or are a diehard fan of Amitabh Bachchan, then Shamitabh is not a film that you can afford to miss! The Guardian weren’t fans either! Kathy – I am seeing your blog for the first time! Balki you must understand is originally an ad film maker who just happens to make films – not exactly a trained auteur – I havent seen the film so cannot comment – but Shamitabh apart, have you seen Paa and Cheeni Kum?! or movies from the 70s and 80s? Hi, Kiran. Balki’s background doesn’t surprise me. I liked Cheeni Kum quite a bit, despite its sappy ending. Paa was better than Cheeni kum – despite the obvious unintentional caricaturing of Bachan’s performance/character as an Asperger afflicted child – and definitely the music in both Paa and Cheeni kum were good – if you watch Hey Ram, you will perhaps notice how the score by the same Ilaiyaraaja fits the narrative. Balkis problem is his open adulation of Amitabh the star – thus his scripts are tailored to the star that he is in love with, rather than focusing on the contents as such. Basically Balki is using his advt film making skills to project the star he adores – with the script serving as only a prop/excuse for what he intends to! its a kind of sycophancy that is killing whatever little creativity he might have. Shocked to see your comments on music. Sorry to say, I found them very juvenile. Best thing about Shamitabh is it’s music. Not sure what kind of music you’re exposed to. The bollywood sounds you hear to these days can not be termed as “music”. Golden era of bollywood music is long gone, and this movie’s music brings back those memories. Tunes are very refreshing and background score adds a new dimension to the film. Almost every review out there has a positive feedback on music, and it’s composed by a man who has done musical score for a 1000 films, besides a few symphonies. You might want to give it another try, with an open mind, as this music is not in regular bollywood masala format. Musical taste is a matter of opinion, Teja. That I don’t share yours doesn’t make my opinion “juvenile.” If Balki’s intent was to evoke a time in cinematic history when every emotional reaction was cued by garish fanfare, then perhaps he succeeded. I found the music a major distraction. We agree to disagree. Also I recall SADMA was by the same composer – have you seen it? I have a feeling you might like it, but fingers crossed since you love DDLJ and might find SADMA way too intense/serious a film – its just not a romcom.